Kuranda is a small town in the mountains near Cairns. In the past only hippies and artists found their way their, but after the introduction of an Arts & Craft market word slowly got around and more tourists started to visit. 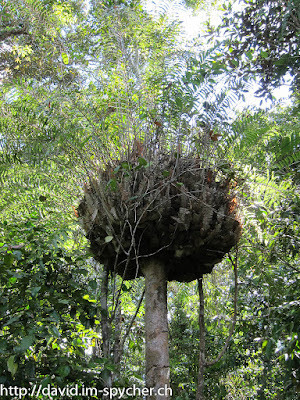 Today, it is one of the most frequented day trips from Cairns. Not only for the sake of the town, but also because of the way to get there. The most boring way is to take a car or a direct bus. It gets more interesting if you use the Skyrail or the Scenic Railway, or as I did, when you combine the two. 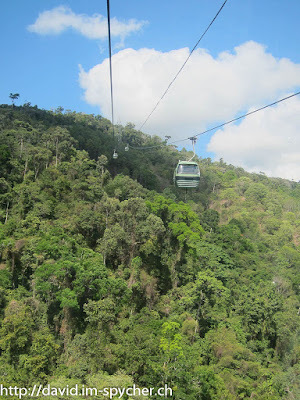 The Skyrail took me high over the rainforest and up towards Kuranda. On the way there were two stops. The first at Red Peak, where a short walkway leads through the rainforest and where we were lucky enough to catch one of the free guided tours. Back on board the Skyrail took us towards the Barron Falls, in places almost touching the rainforest canopy, allowing for breathtaking views. At Kuranda station I took the meandering river walk towards the market, finding a Geocache on the way :). 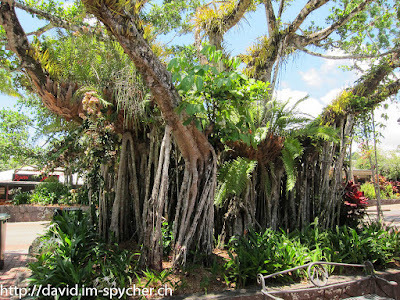 Even though it is now a tourist hot-spot and there are a plethora of shops and markets, Kuranda kept its old-style hippie flair and I enjoyed walking around browsing for gifts and souvenirs. 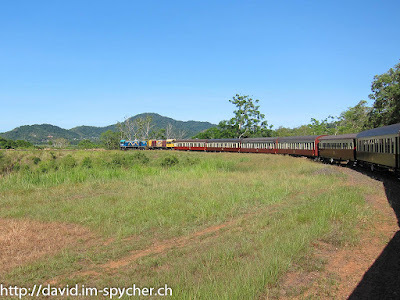 On the way back I took the Kuranda Scenic Railway, which consists of restored heritage wagons and drives slowly back to Cairns along sheer cliff faces, rainforest and waterfalls. 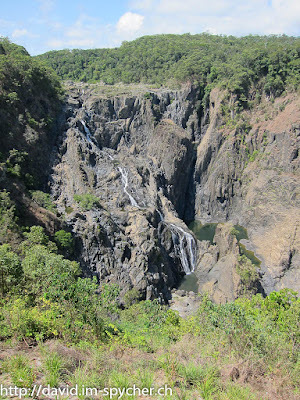 There was a short stop at Barron Falls Station, giving us the opportunity to enjoy the falls from the other side. I really enjoyed my day in Kuranda, especially the way there and back again :). A couple of more pictures can be found in my web album.